Humans love maps. Every day in the Scholars’ Lab we help aspiring cartographers navigate the complexities of geographic information systems software. But software is expensive and requires electricity. What if we could make a cartographic masterpiece appear on an ordinary sheet of paper without installing any software or downloading any data or loading any batteries in our GPS? That’s instant gratification mapping via plane table methods. So let’s “go directly into the field and do them”! We’re talking about old-school cartography. As early as the 16th-century, writers described the plane table method in detail. 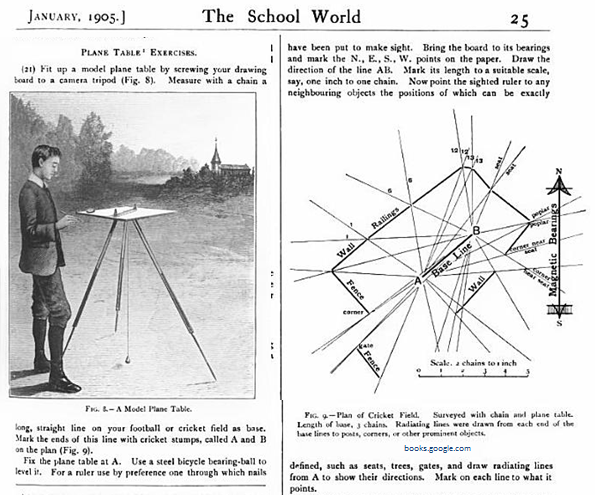 Long before computers and software, early 2oth-century school boys in knickers were taught to map distant church steeples by “screwing your drawing board to a camera tripod”. Historic resources like Low’s Plane Table Mapping inform our methodology. Modern interpretations of plane table mapping as art expand the boundaries beyond the two dimensional plane. A new crop of 21st-century plane table mappers are in the field, among them geography students at Texas A & M University. 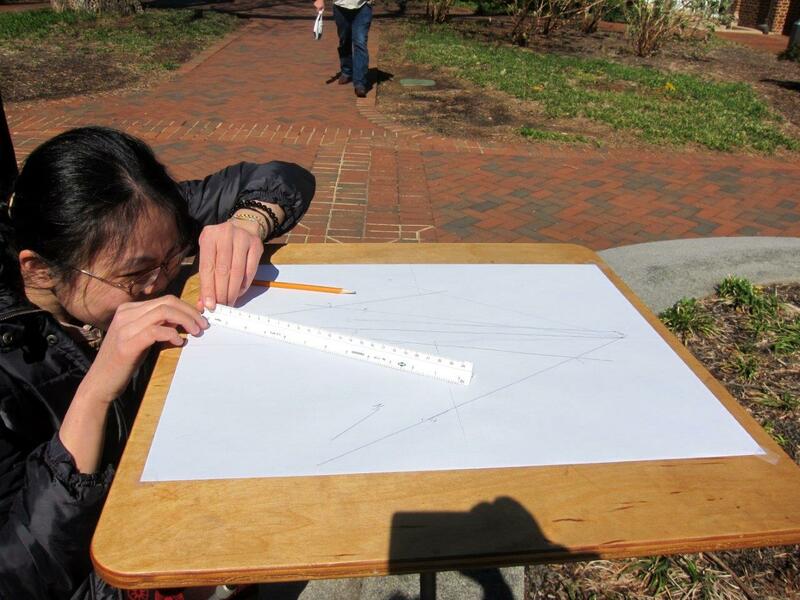 We developed our Scholars’ Lab plane table mapping workshop with a low-cost do-it-yourself mindset. For our work surface (or plane table) my Scholars’ Lab colleague Chris Gist attached a plywood table top to a camera tripod. 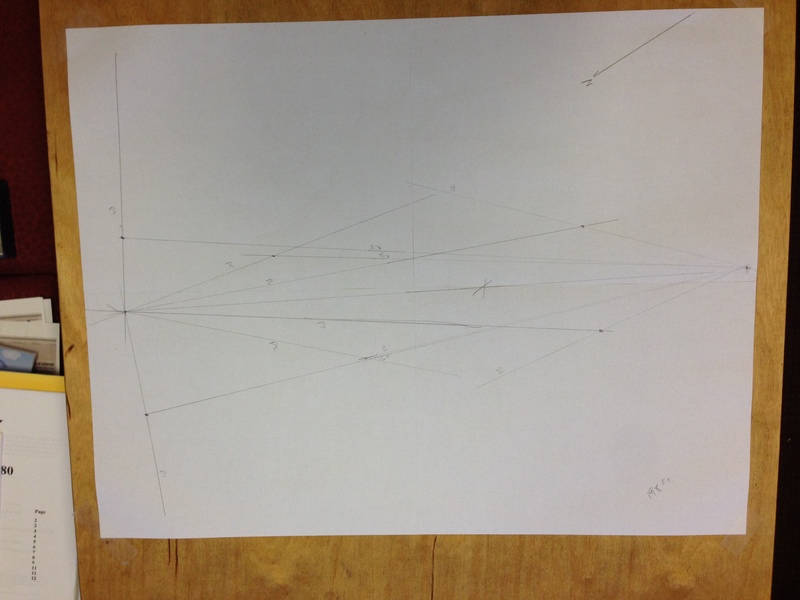 Rather than invest in an expensive alidade for sighting distant objects, we used the edge of a triangular architect’s scale. A second-hand compass pointed to magnetic north. A smartphone app helped level the table, as will a marble. A set of keys on a string served as a plumb line. A pencil and eraser completed our mapping toolkit. In our workshop introduction we covered the basics of establishing a baseline, then sighting from multiple stations toward each visible landscape feature to create intersecting lines. The map began to emerge on the paper without taking a single distance measurement. Lines and angles were drawn using only visual methods. If we could see it, we could map it from afar even if the feature was behind a locked gate, across a busy street, or otherwise inaccessible. We’re beginners, so in our one-hour workshop we had our hands full making a simple map on level ground. 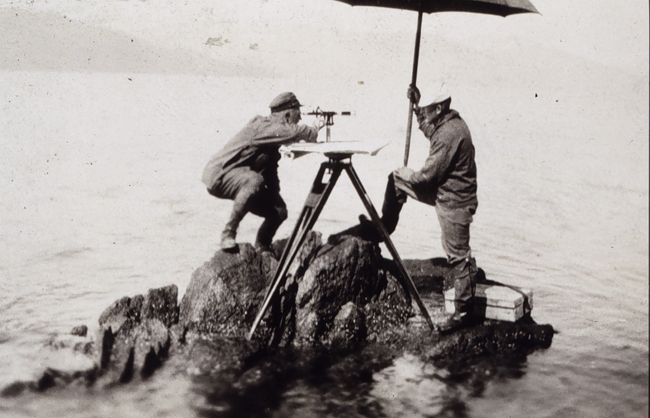 We didn’t expand into the complexities of plane table mapping on uneven terrain. Even on flat ground we made mistakes. We struggled with leveling, sighting, slipping scales, and tilting tables. We learned that when something is wrong, it’s quickly apparent while still on-site and can be corrected. Mistakes are discovered and corrected in real-time, not later back in the office. This was fun. I had no idea how maps were made before GPS. I’ll use this to illustrate to my students how errors can easily creep into any data collection exercise. 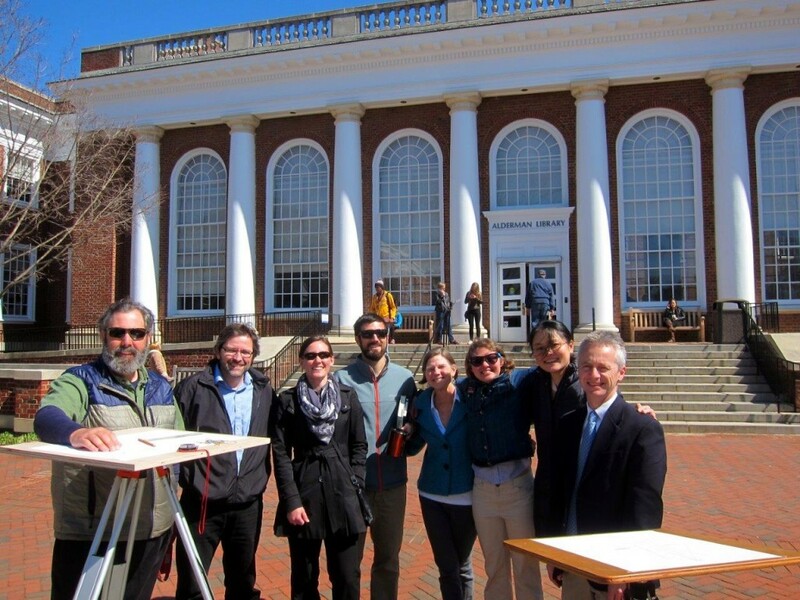 Thanks to Schaeffer Somers, University of Virginia School of Architecture, for the equipment loan. Cite this post: Kelly Johnston. “Plane Table Mapping aka Instant Gratification Mapping”. 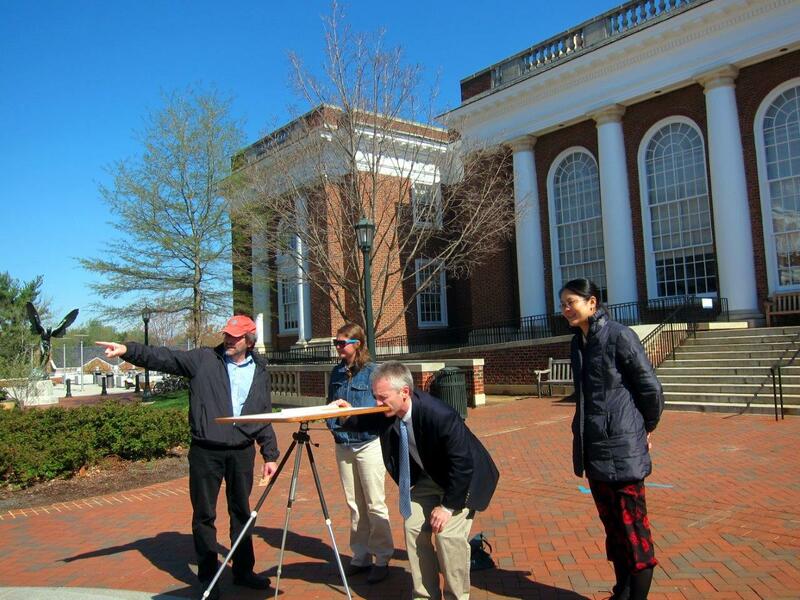 Published April 28, 2014. https://scholarslab.lib.virginia.edu/blog/plane-table-mapping-aka-instant-gratification-mapping/. Accessed on .